From a distance you never see the leaves for the trees. But if you look closely you can see the natural aerosols. They rise spectre-like from the forest and linger as a blue haze on the horizon almost everywhere on Earth. 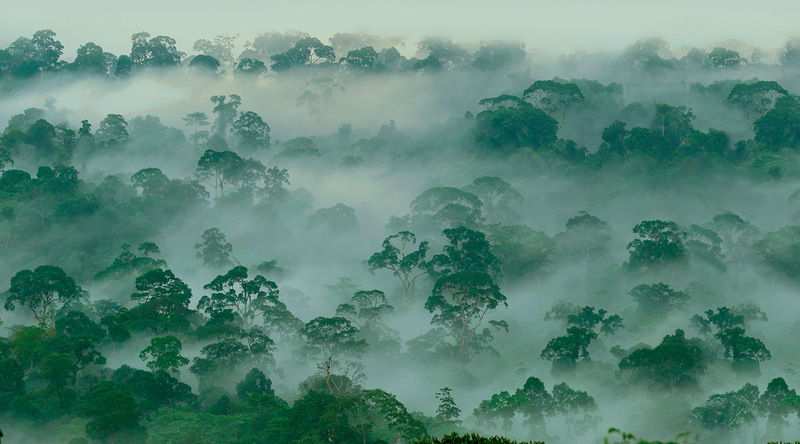 The global forest produces this invisible, protective mantle of airborne molecules. These chemicals hold a design for lift much like a bird or a bee. They float away to join the tide of atmospheric gases and water vapour that guard this planet. The tide of gases in the atmosphere is in constant flux. Usually, these are seasonal changes. The atmosphere feels a form of dormancy in winter but spring brings with it a fresh flush of oxygen to brace the world with new growth. This flush is called a respiration curve. In medicine, such curves are indicators of health for all breathing, living creatures – of which this planet is one. Oxygen goes into the lungs and carbon dioxide (CO2) comes out. In recent years, the atmosphere is showing that this has far-reaching consequences for life itself. An atmosphere with high concentrations of carbon dioxide is a killer. The haemoglobin of all creatures, including humans, will bind with either oxygen or carbon dioxide. The oxygen reaction is a reversible one. The CO2 reaction is not, forming carboxymethemoglobin followed by illness and possibly death. Trees and forests are the great protectors of life. They make ample use of toxic CO2, flushing it into their green system and spilling out oxygen from the chlorophyll molecule itself. The carbon is routed into building wood. The trees grow and mature on this menu and forests are born. Forests are finely tuned, molecular machines that must harvest the sun. Trees are around 400 million years in the making, with a DNA library more complicated than the human genome. These green machines have a quantum grab where they can pull the sun’s energy out of the photon and place it into a chlorophyll electron. From the backscatter dance of a free photon on the surface of a leaf, the power of photosynthesis arises. This is the foundation of our food on land and sea. As the forest matures, photosynthesis feeds many biochemical pathways within the tree. Some are used to produce amino acids, proteins and hormones. Others are chained together to make the three essential fatty acids for embryogenesis (reproduction). Labile, protective chemicals move into pockets – glandular tissues in leaves; trichomal hairs, resin ducts and the oleoresins on the tip of a root or shoot. Photosynthesis also feeds fungal and lichen life forms, both inside and outside each tree. Many of these naturally occurring chemicals (phytochemicals) join the aerosol armies that are released into the atmosphere. Each species of tree has its own chemical identity that is always true to its own genome. The greater the diversity within the forest, the more varied is the biochemistry and the more interactive the synergy between the released chemicals. Sometimes the aerosols are released under pressure like a landmine. More often it is the physics of the sun’s heating that drives the release. Other times the aerosols require carrier compounds to aid in their lift. Aerosols have a unique ecofunction in the atmosphere. Many are ‘scrubber’ compounds, like detergent. Their aseptic character helps clean the air. Some harbour hallucinogens or have gentle anaesthetic characteristics. Many are antiviral, antifungal and antibiotic. There are also complex, anti-cancer biochemicals that become airborne, like those of the pine family. There are 200 or so species of pine threaded through the global forest – from the Jack pine (Pinus banksianna) of the northern boreal to the Kauri pines (Agathis australis) of New Zealand. Pines all produce alpha and beta pinenesa. Research in Japan has found that these aerosols protect the body against cancer by boosting the immune system.1 Something similar happens in the warmer forests of the Americas, Asia and Tasmania with another aerosol, taxodione, produced by the cypress family. Taxodione has strong tumour-inhibiting properties. And then there is paclitaxel, produced by a yew tree of the Taxaceae family and used routinely in the treatment of breast cancer. The human body, with its surface layer of epithelial tissue, is built by design to capture aerosols. Some of them, like many perfumes, have a natural fixative when they land on the skin. They can be slowly absorbed either in a fat or water-soluble state. The body recognizes the molecule and will use it if needed. This is the basis of forest bathing, saunas, native sweat lodges and the ancient tig n’ allais, or house of perspiration of the Druidic priests. Aerosols have one more big advantage: they come free as the air with a walk in the woods. Diana Beresford-Kroeger is a botanist, medical biochemist and author of The Global Forest. She lives on a 40-hectare farm near Ottawa, Canada. The best contacts to check out for news, research and facts on deforestation, forest peoples, resource extraction and climate change.